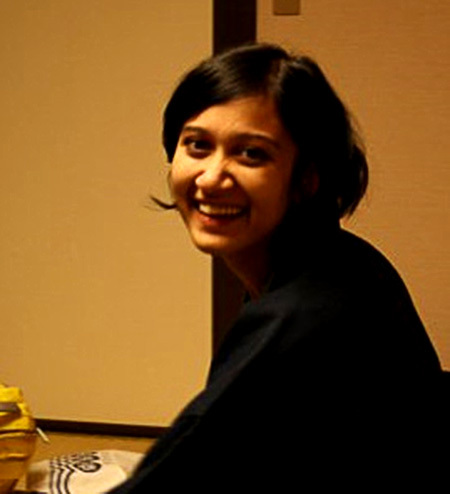 Founded in 2010 by Bidisha Basu, Koel Chatterjee, and Utsa Shome, Leaping Windows began life as an Internet-only lending library for comics books, graphic novels, and manga in Mumbai. In just two years, it has grown to become a full-blown brick-and-mortar library and café—it is the place to be if you’re a comic book reader in the city. What started as an online graphic novel lending library has blossomed into a real-life library, reading room, and café. How did the idea come about? The café was inspired by the manga cafés of Japan. They’re really quite different from our end product here, though I guess the basics are the same. A place to just chill, drink something nice, probably grab a bite, and read comics. 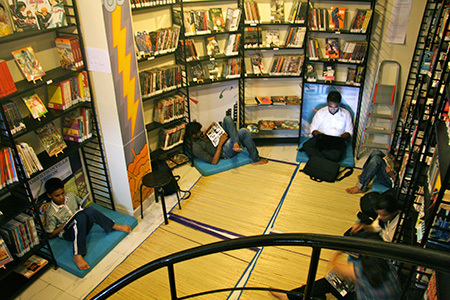 The Leaping Windows library and café is based in a quiet corner of Yari Road, Mumbai. The Leaping Windows café was started in the first half of 2012, almost two years after you launched the online library. Was it always your intention to graduate to a brick-and-mortar library and café? Yes! That was always the dream. [It’s] just that we were never sure [whether] it would materialise into anything. Could you tell us about some of the hurdles you faced initially? Money was the biggest hurdle. The lack of it! Also things moved very slowly in the start because only one of us was doing it even partially full-time (that was me), and Koel and Utsa had full-time jobs. Also, for the café part of it, none of us had any experience, so the learning curve was very sharp. The place found us, really. A friend of the previous owner suggested we check out the clearance sale for the books [in the old library] and we just loved the place. A corner shop with a huge glass window. All that shelving, a basement! How could we resist? What sort of response have you received from readers across the city? How many members do you currently have? How extensive is your catalogue? What can people expect to find at the library? We have about 2,000 trade paperbacks and hundreds of single issues—quite a treasure trove. Many of the shelves are dedicated to manga, and [there are] some rough divisions for independents, series, and DC/Marvel and Dark Horse books. There’s also a kids sections with Amar Chitra Katha, Tintin, Asterix, and a whole bunch of European kids comics. We have a lot of stuff but there’s always more to be had (smiles). Are there any books or series that are especially popular among Leaping Windows members? What are some of your favourite comic books? Well, there are some of the obvious hits—Batman, Spiderman, and most things superhero-related get a lot of readers. But there are lots of people reading independent comics as well, with authors like Craig Thompson, Joe Sacco, Marjane Satrapi, and Neil Gaiman being hot property. Among my favorite comics (including manga) are Daytripper, Britten and Brulightly, Blankets, the Fables series, Death Note, Buddha, and Dragon Ball—that’s just to name a few (smiles). Are there certain things you are looking to change, add, or improve over the next few months? Are there any new locations planned? We’re not tackling any other cities—not this year, at least! We want to concentrate on getting more organised and getting more books into our collection. We’re also hoping to come out with a small range of Leaping Windows merchandise. You can learn more about Leaping Windows and become a member at this location.